Ebola virus and bats have been waging a molecular battle for survival that may have started at least 25 million years ago, according to a new study led by researchers at Albert Einstein College of Medicine, the University of Colorado-Boulder (CU-Boulder) and the U.S. Army Medical Research Institute of Infectious Diseases (USAMRIID). The findings, published in the journal eLife, shed light on the biological factors that determine which bat species may harbor the virus between outbreaks in humans and how bats may transmit the virus to people. The other study co-leaders are Sara Sawyer, Ph.D., an associate professor of molecular, cellular, and developmental biology at CU-Boulder, and John Dye, Ph.D., Viral Immunology Branch Chief at USAMRIID. Outbreaks of Ebola virus disease among humans are thought to begin when a person comes into contact with a wild animal carrying Ebola virus. 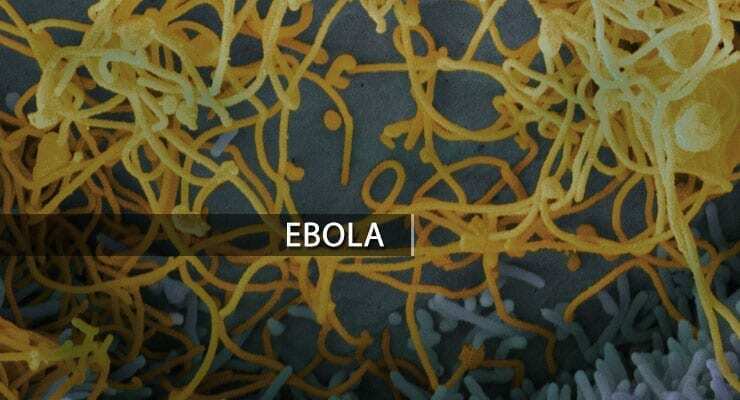 “Unlike HIV or influenza virus, Ebola virus stays hidden in an unknown natural reservoir between outbreaks,” said Dr. Dye. Prior research points to some types of bats as possible viral reservoirs, but little is known about how Ebola virus interacts with its presumed reservoir hosts. “We mapped this resistance to a single amino acid change in the NPC1 gene of this bat,” said Dr. Chandran. “This tiny change prevents Ebola from binding to the NPC1 receptor.” So the African straw-colored fruit bat–suspected as an Ebola virus reservoir in the recent Western African epidemic–was probably not guilty. Interestingly, some non-Ebola filoviruses were able to infect cells from all of the types of bats tested, including the African straw-colored fruit bat. “Those viruses already had the amino acid change that allowed the mutated Ebola virus to infect straw-colored fruit bat cells, so they didn’t have any problem binding to the different NPC1 receptors,” said Dr. Chandran. The authors propose that this genetic change in the glycoprotein sequences of some filoviruses may have evolved to counteract changes in the NPC1 sequences of their bat hosts. The research team then genetically analyzed NPC1 in 13 bat species. They found that the part of the NPC1 receptor where Ebola virus attaches has evolved rapidly in bats–more quickly than in humans and other primates. This rapid evolution, the researchers concluded, was likely driven by a long-term co-evolutionary ‘arms race’ between bats and filoviruses. How long? “We discovered that a gene segment derived from a filovirus found its way into some bat genomes at least 25 million years ago,” said Dr. Chandran. This is almost twice the timespan that bats were thought to have been exposed to filoviruses. Read more: Filovirus receptor NPC1 contributes to species-specific patterns of ebolavirus susceptibility in bats.